Can a boson, like a photon, have half-integer angular momentum? In three dimensions, no. The familiar quantum numbers l and ml, for orbital angular momentum; s and ms, for spin angular momentum; and j and mj for the resulting total angular momentum, are all integers. However, a beam of light singles out a particular direction in space. The electric field, which must be perpendicular to this direction, is essentially a two-dimensional vector, specified over the plane perpendicular to the beam. Particles moving in two dimensions can have strange properties, including quantum numbers which are fractions of those expected in the general three-dimensional setting . Given the restricted geometry of a beam of light, and the analogy with quantum mechanics in two-dimensions, it is intriguing to ask whether we could see similar effects there. In our recent paper  we find that this is indeed the case: we show there is a physically reasonable form of angular momentum in a beam of light, which has an unexpected half-integer spectrum. The study of light’s angular momentum  is an old one, going back to Poynting’s realization that circularly polarized light carries angular momentum because the electric field vector rotates. This spin angular momentum is one contribution to the total angular momentum carried by a light wave; the other is the orbital angular momentum, which arises from the spatial variation of the wave amplitude. We were led to the idea of the half-quantized angular momentum by the structure of beams generated by conical refraction, which is shown in Figure 1. Figure 1: Cross section of conically refracted beam. The beam is a hollow cylinder, as can be seen from the intensity plotted in the gray scale. 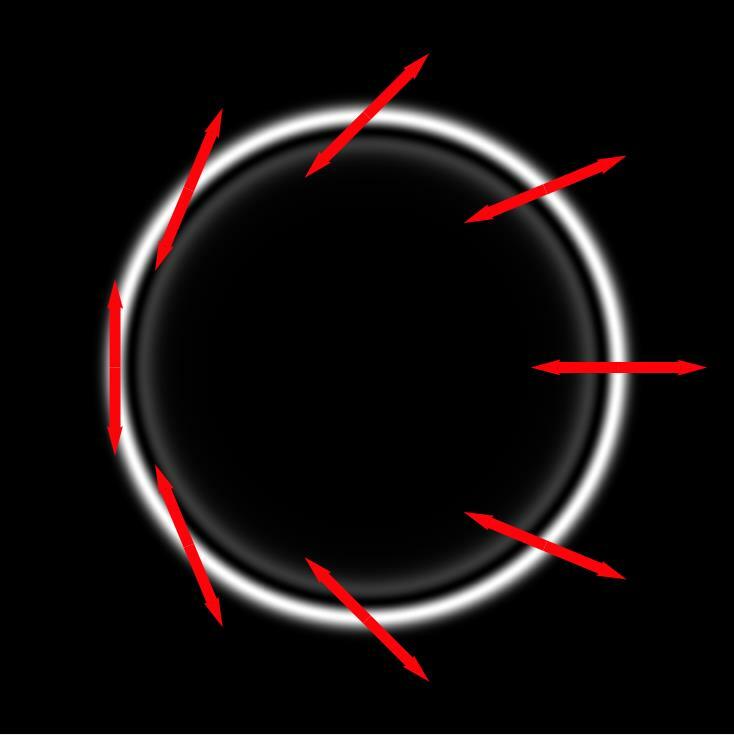 The direction of linear polarization at each point around the beam is shown by the red arrows; it takes a half-turn for one full turn around the beam. Figure adapted from . This exotic form of refraction was discovered in our own institution, Trinity College Dublin, almost 200 years ago, by William Rowan Hamilton and Humphrey Lloyd. They showed that on passing through a “biaxial” crystal a ray of light became a hollow cylinder . At each point around the cylinder the light is linearly polarised, meaning the electric field oscillates in a particular direction. However, if we take one full turn around the beam, the direction of linear polarisation takes only a half-turn. Conical refraction has introduced a topological defect into the beam : a knot in the wave amplitude, which cannot be untied by smooth deformations of polarisation or phase. Similar transformations can be achieved using inhomogeneous polarizers called q-plates. Any beam of light a beam can be decomposed into beams which have an exact value of some angular momentum. These are eigenstates of that angular momentum, defined by the property that when they are rotated they change only by a phase. For spin angular momentum, the relevant rotation is that of the electric field vectors, while for orbital angular momentum, it is a rotation of the amplitude. These rotations are both symmetries of Maxwell’s equations in the paraxial limit, so that they can be performed independently, or in any combination. Thus the choice of basis for optical angular momentum, and the definition of the angular momentum operators, is not unique. If we consider beams which are rotationally symmetric under an equal rotation of the image and the polarisation, we get the conventional total angular momentum: the sum of orbital and spin quantum numbers, which is always an integer multiple of Planck’s constant, ħ. We showed that an equally valid choice is those beams which are symmetric when we rotate the image by one angle, and simultaneously rotate the polarisation by a half-integer multiple of that angle. The conically refracted beam is exactly of this form. The corresponding total angular momentum is a sum of the orbital contribution and one-half of the spin contribution, so that these beams have a total angular momentum which is shifted by ħ/2. Figure 2: (A) Average angular momentum per photon as measured by interferometer. As the input beam is varied the average angular momentum goes from 1/2 to -1/2 in units of Planck's constant. (B) The quantum noise in the measured angular momentum. The minimum value corresponds exactly 1/2 of Planck’s constant being carried by each photon. (This Figure is reproduced from Ref. ). 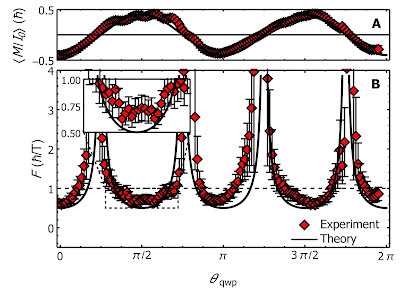 To measure this effect we built an interferometer, similar to the design used by Leach et al. . The angular momentum eigenstates which make up any beam are, by definition, invariant under rotations up to a phase. When we rotate the beam, this phase means each component will interfere either constructively or destructively with the unrotated beam, so we can infer the amplitude of that component from the resulting intensity. In our experiment we rotated the amplitude and the polarisation by different amounts, which allowed us to measure the different types of angular momentum described above. The experimental results are shown in Fig 2(A). We use a quarter-wave plate (QWP) to vary the polarisation of our laser, and generate conically refracted beams with opposite handedness. As we move gradually between these beams the average of the relevant angular momentum varies between 1/2 and -1/2, in units of ħ. Since photons with varying integer angular momentum could combine to give a fractional average, we wanted to show each photon carries exactly this amount. Rather than measuring single photons individually, we adopted a technique previously used to measure the charge of quasiparticles in the fractional quantum Hall effect . This relies on the fact that in a current of particles there will be some inherent quantum noise, due to the discrete arrival of those particles, which is proportional to the size of the quantum of that current. We measured the quantum noise in the output angular momentum current of the interferometer described above. Fig 2(B) shows this noise, normalised in such a way that the minimum is the angular momentum carried by each photon, plus any excess classical noise still present. When the input beam is in either conical refraction state, this value dips well below one and approaches one half, demonstrating the half-integer angular momentum of each photon. The possibility of exotic “fractional” quantum numbers  in two-dimensional quantum mechanics is known to occur in practice in electronic systems, and specifically in the quantum Hall effect. Our work is the first to show such behaviour for photons, and suggests that other aspects of this physics might be possible with light. Quantum optics gives the ability to transmit quantum information over large distances and process it at very high speeds. We have identified a new form of a familiar property, optical angular momentum, that may prove useful in such developments, and gives a new twist in our understanding of light. Frank Wilczek, "Magnetic Flux, Angular Momentum, and Statistics", Physical Review Letters, 48, 1144 (1982). Abstract. Kyle E. Ballantine, John F. Donegan, Paul R. Eastham, "There are many ways to spin a photon: Half-quantization of a total optical angular momentum", Science Advances, 2, e1501748. Abstract. L. Allen, Stephen M. Barnett, Miles J. Padgett, "Optical Angular Momentum" (Institute of Physics Publishing, 2003). M. V. Berry, M. R. Jeffrey, "Conical diffraction: Hamilton's diabolical point at the heart of crystal optics", Progress in Optics, 50, 13 (2007). Abstract. J. F. Nye, "Lines of circular polarization in electromagnetic wave fields", Proceedings of the Royal Society A, 389, 279 (1983). Abstract. Jonathan Leach, Johannes Courtial, Kenneth Skeldon, Stephen M. Barnett, Sonja Franke-Arnold, Miles J. Padgett. "Interferometric Methods to Measure Orbital and Spin, or the Total Angular Momentum of a Single Photon", Physical Review Letters, 92, 013601 (2004). Abstract. C. L. Kane, Matthew P. A. Fisher, "Nonequilibrium noise and fractional charge in the quantum Hall effect", Physical Review Letters, 72, 724 (1994). Abstract.